Do you have short straight lashes that stick straight out even after you use an eyelash curler? Then Lash Lifting is for you! It’s a service that delivers the same lift and curl of extensions without the high cost and damage they cause to natural lashes. So ditch the curler and falsies forever and learn about this new beauty service that is less expensive and more reliable! Lash Lifting is a natural enhancement of eyelashes that makes them curl up so they are more noticeable without the use of mascara or extensions. Lashes are wrapped around a rod and secured with a medical-safe glue and then a special solution that does NOT contain Keratin/formaldehyde or peroxide, but does have aloe and glycerin to sooth, is applied to reform the hair bonds so they curl up. Does it ruin or pull out natural lashes? 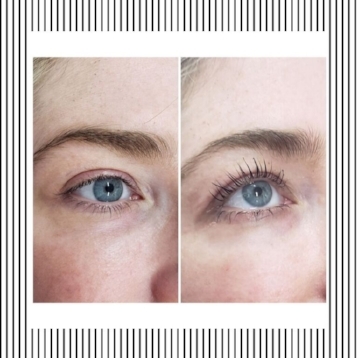 No, done correctly a lash lift can actually benefit lashes. The serum and glue used both contain biotin and formaldehyde- free keratin, which are nourishing to lashes. Also, unlike lash extensions, there is nothing weighing on lashes to add stress to the hair follicle contributing to damage, breakage or lack of growth. A lash lift typically lasts about 6-8 weeks, depending on hair growth cycles…hair follicles grow out at different times, so maintenance is done as needed for each individual. Yes, 48 hours after having the process mascara can be applied, as long as it is oil-free. All products used on eyes after the service should be water-based and oil-free, so check labels. Can I wash my face after? Yes, with tepid water for the first 48 hours. Extremely hot water will drop the lift. So even in the shower, do not run face in water for 48 hours. Other than gorgeous lashes, NO! It’s even safe for those with sensitive eyes. No, most people even doze off during the process. Should I do a tint with a lift? Absolutely, whether you’re blonde w/blonde lashes or dark haired! Aside from the dramatic color change, a tint can add a nice polish even for darker lashes. Why is it good if lashes are already dark? Most people’s lashes lighten at the tips in warmer weather out in the sun…or even just naturally. Tinting defines the ends and brings out the true length of lashes. Lash Lift/Tint $115, $99 for first timers. Our lash expert Niki Garcia says people are switching to lash lifting from extensions because it’s more manageable. It’s less expensive, takes less time, lasts longer, and eyes can be touched, rubbed and washed without getting irritated. PLUS, it reduces the stress on your natural lashes and keeps them healthier. You can always save the lash extensions for special occasions and more drama! To book an appointment with Niki, call 646-787-5889 or email nichole@cosmeticsnichole.com. Share if you know someone who needs a lift.